Learning with wild bird field guide books is great fun! 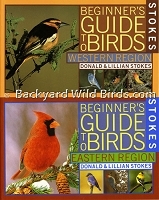 Bird field guide books have photos, bird identification and info on their habitat, etc. They truly make backyard birding some much more enjoyable when you can find out all of their likes, how to attract songbirds and what makes them special. 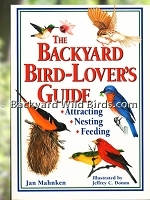 Backyard Bird Lovers Guide is everything you want to know about feeding, territory, courtship, nesting, and parenting characteristics of 135 bird species. 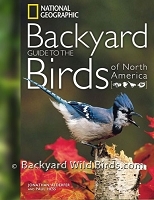 Backyard Birds Guide for North America is the only comprehensive guide of its kind, this book is for households interested in attracting and identifying birds in their own backyards. Bird Butterfly Sticker Books is full with annotated factual bird and Butterfly information in two books that each contains more than 60 full color, reusable stickers. 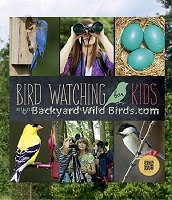 Bird Watching for Kids book is filled with entertaining and fulfilling projects that allow children to interact with nature while learning about the needs and behaviors of wild birds. Nice to combined with one of the Compact Binocular Kits. Birding Journal through the seasons is beautifully designed with nice illustrations. This journal makes bird watching record keeping easy. This book is set up by seasons, starting with spring. Start off right with Beginners Guide to Hummingbirds Book, 6 port Hummingbird feeder, hummingbird 8oz. Nectar. Learn how to setup and maintain a great Hummingbird feeder. Kaufman Field Guide to Birds is a new style to carry into the field. Everything in this Field Guide is designed to make it the easiest guide that every bird watcher will want to carry into the field for bird watching enjoyment. A great Bird Field Guide is Peterson Bird Field Guide book, Birds Of Eastern and Central North America, 6th Edition. Bird watching is made fun for the bird watcher with suberb info like this! 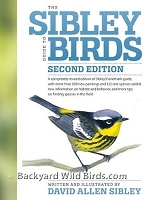 The Sibley Guide to Birds 2nd edition is what a complete bird watching guide book should be. The Sibley Guide to Birds by David Allen Sibley is recognized as a leading bird watching book authority. He is America's most gifted contemporary painter of birds.